I first got hooked on historic preservation while earning my Master's Degree in Urban Planning from UCLA. When I learned about the many architectural styles of American architecture, I started noticing examples around Los Angeles. Then I won a grant to find and help designate a historic district in Los Angeles (that happy story later!) and have been "building watching" ever since. You see, buildings, unlike birds, don't generally fly away (although they do get demolished!). 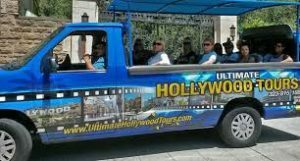 My tour - Historic Districts of Los Angeles - is the best way I can share my love for historic neighborhoods with my friends and clients. The beautiful Victorian homes on Carroll Avenue are a highlight of the tour. Many of the homes are over 100 years old. When one thinks of LA, many images come to mind - Hollywood, freeways, fast cars and beautiful people, but not historic districts. 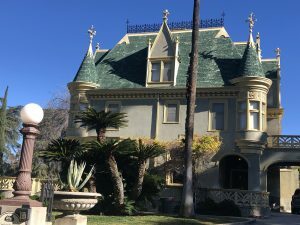 In fact, however, Los Angeles is actually home to 35 locally-designated historic districts, and the city may have the most diverse architecture in the world. One of my greatest pleasures when visiting LA or giving a tour is admiring this tremendous cornupocia of architectural styles. 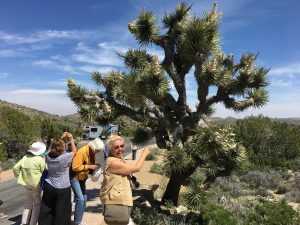 My tour - Historic Districts of Los Angeles - highlights seven neighborhoods in one action-packed day. is Beaux Arts/French Baroque style. It is located in a National Register Historic District. SPRING STREET FINANCIAL DISTRICT - Once known as "Wall Street of the West", Spring Street in downtown is home to the City's first skyscraper and many of the Beaux Art/Classical Revival buildings which were once banks. Spring Street is most famous for its "Beaux Art" office buildings. This early 1900 style featured "building as column" with a three part design see here: base, capital and shaft. Classical detailing was often used on banks and government buildings to lend them a formal, traditional look, with a nod towards Greek democracy. the three-part Beaux Art composition. BROADWAY THEATRE AND COMMERCIAL DISTRICT - Broadway used to be the place to go in LA to see a movie or a movie star. It is the first and largest historic theatre district in the US listed on the National Register. On a six-block stretch, the district contains 12 theaters built between 1910 and 1935. Some are so old, in fact, that they were built for Vaudeville performances in the age of silent movies. The styles of these wonderful old theaters is delightfully varied including Art Deco, French Baroque, Gothic, Chirrigueresque, and Italian Renaissance. Many have been restored for live performances and concerts while others are open only for special screenings. A few have been converted to retail stores. 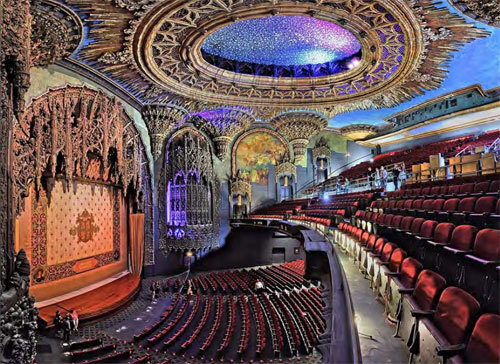 The LA Conservancy does periodic walking tours of the theaters with opportunities to view their ornate interiors. The interior of the Ace Theatre (Ace Hotel formerly United Artists Theatre) is an ornate, almost creepy Spanish Gothic style. 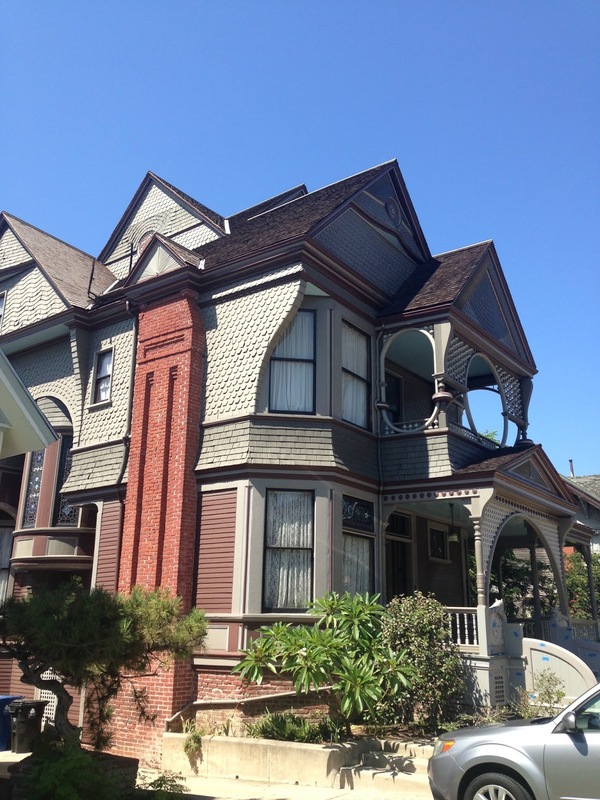 CARROLL AVENUE AND ANGELINO HEIGHTS: This stop on the tour actually features two historic districts in one. Carroll Avenue, a National Register Historic District, is located in the center of the LA's first Historic Preservation Overlay Zone - Angelino Heights. This neighborhood, called LA's first suburb, is known for its turn-of-the-century Victorian architecture as well as Craftsman and Mission Revival styles. Sitting on a hill just two miles northwest of downtown, Angelino Heights and Carroll Avenue are delightful neighborhoods to stroll. The Historic Ordinance requires that the neighborhood buildings be at least 50 years old and reflective of a characteristic architectural style, famous person or event. 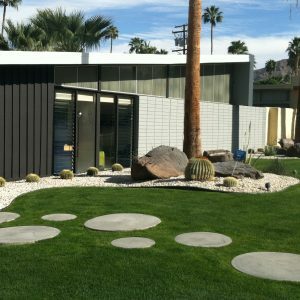 Since Los Angeles had a tremendous building boom in the first decades of the 20th century, there remain many beautiful examples of this period revival styles including Spanish Colonial, Tudor, Dutch, French Second Empire, Prarie, Colonial, Italianate, Beaux Art, Art Deco, Streamline Moderne, and many more. HANCOCK PARK - You will love this gorgeous period revival district with its palatial, two-story homes on 50 foot setbacks. In fact, if you like historic architecture, there is no more beautiful and impressive neighborhood than this. Built on land purchased in 1863 from Rancho La Brea (yes, the Tar Pits, baby!) 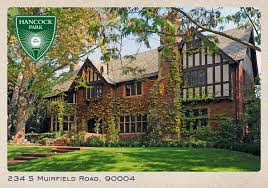 and developed by Major Henry Hancock's son, G. Allan, we will see Tudor Revival, French, Spanish Colonial, American Colonial, Monterey and Georgian styles. This was a neighborhood of homes built by prominent architects for prominent people, including movie stars. English Gothic home with bay windows. 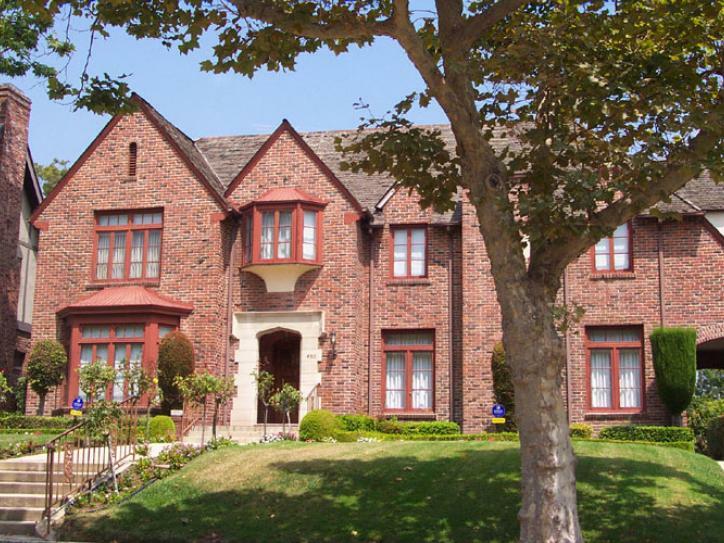 Tudor Revival was very popular with affluent and not-so-affluent home owners. WINDSOR SQUARE - Adjacent to Hancock Park, this historic district has even larger homes. 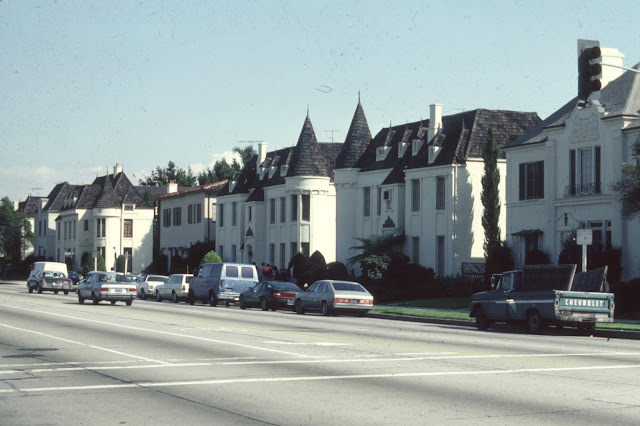 Developed to be the most elegant neighborhood in Los Angeles with minimum lot frontages of 100 feet and lot width of 300 feet, Windsor Square represents a broader time period of architecture with early Craftsman and Beaux Art/Classical Revival styles complemented with later period revival and even California Ranch styles. 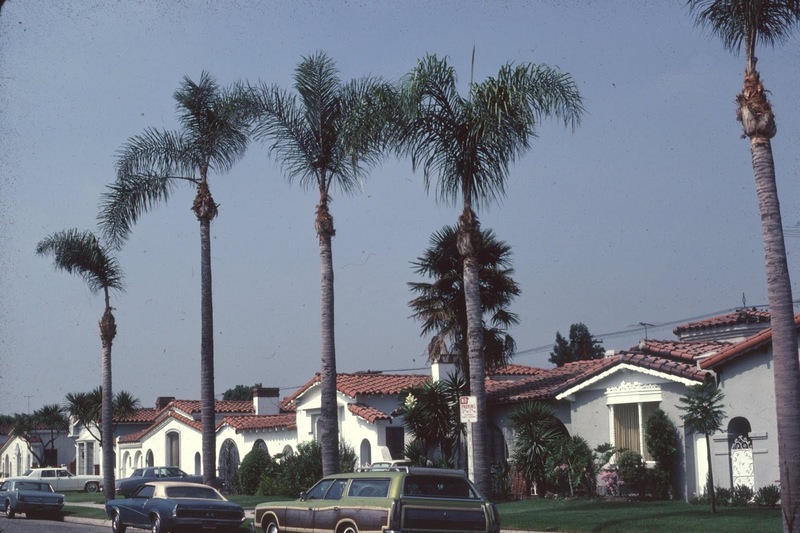 SOUTH CARTHAY HISTORIC DISTRICT (1985) - Our last stop on the tour is closest to my heart because this is the neighborhood that I nominated in 1984 after receiving a grant from the School of Urban Planning at UCLA. This wonderful neighborhood - bordered by Pico and Olympic, La Cienega and Crescent Heights Boulevards - features a wide variety of styles but not the palatial elegance of Hancock Park or Windsor Square. In fact, most of these homes weren't designed by architects at all, but rather built by Greek American developer Spyros George Ponty. Most of the homes are single-story Spanish Colonial with impressive craftsmanship. They feature low pitched tile roofs, arched windows and doors, stain-glass windows, and decorative tile in the bathrooms, kitchens and on the driveway arches. Indeed, no two of the homes are alike. were built in the South Carthay neighborhood by contractor Ponty in the 1930s. Other parts of South Carthay provide great examples of 1930s period architecture. On the northern border along Olympic Boulevard are excellent stretches of Chateauesque apartments. The style's steeply-pitched roofs, corner turrets, dormer windows and decorative plaster work can be found throughout West Los Angeles, but seldom in such concentrations. On the eastern border of the district are beautiful two-story Spanish colonial apartments in contrast to the single-family homes inside the district. In the south are some examples of Tudor and American Colonial Revival with several Streamline Moderne apartments found as well. During the research for historic designation, I was sad but not surprised to learn that in the 1930s and early 40s, restrictive covenants prevented African Americans, Hispanics and Jews from living in the neighborhood. In 1949, the Supreme Court declared racial covenants unconstitutional. 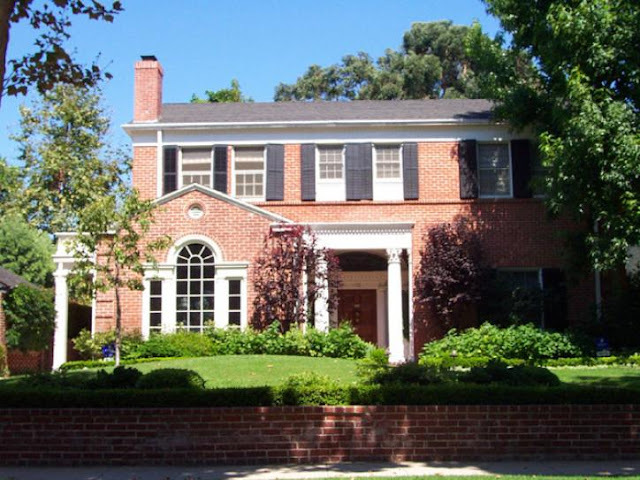 Many of LA's HPOZs (historic districts) contain period revival styles from the 1920s and 30s. Pictured here is a beautiful block of Chateauesque apartments in the South Carthay HPOZ neighborhood. 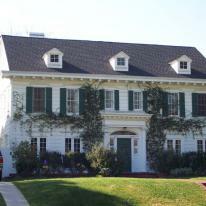 I hope you will join me on the Historic Districts of Los Angeles Tour. We will see over 15 architectural styles and also study how the ordinance affects new development. Can architectures build new homes in these historic districts that are respectful of the context but not mere copies? Also, we will investigate the effect of historic district designation on property values. Certainly, the Historic Preservation Overlay Zone program has been a huge success since its inception in the early 1980s. There is much to explore, and it's nice that Angelinos are preserving parts of their built history.